Greetings! I created this blog to provide information about various projects and to promote my books, Building a Small Cable Suspension Bridge with the Cable Locking System and Building a Wood-Framed Panelized Yurt. You can read book ordering information below. I have included several posts on this blog that are clips from the bridge book as well as additional information, such as a complete materials price list. I have also posted several posts about our yurt book, including a materials price list plus floor and roof plans. If you have specific questions about your bridge or wood-framed yurt project, feel free to email me, but as for bridge design, I’ll be honest: as stated in the book, I am not an engineer. I can’t make specific recommendations for your particular bridge project. Bridge designs are all site-specific and all kinds of factors must be considered before installing a structure such as this one. But that said, I do like to share ideas and hear yours. I can be reached at marvinad.mad (at) gmail (dot) com. I don’t always answer very quickly, but I do answer eventually. Cable locking system components: While I hoped to provide parts for the cable locking system to individuals, the costs to manufacture and ship a small number of the components has made me conclude that it’s not worth it. The beauty of the system is that the parts can be manufactured easily. Just follow the specs in the book. Marvin Denmark, a carpenter and craftsman with 50+ years of experience, shares the procedures he used to build and assemble all the components of a 12-sided wood-panelized yurt. The structure is based on the original yurt design, employing a center ring and tension cable, but it is built using wood-framed panelized construction that includes radial rafters similar to a traditional yurt. A panelized building system means that the components can be constructed off-site and then transported to the site for assembly. There are two editions of this book. This is the full color edition: Detailed instructions, photographs and illustrations include the design, materials list and cut-list for a 16-foot diameter wood structure. This yurt was a 1st-place winner in the 2018 Tiny Homes Contest on Instructables.com. 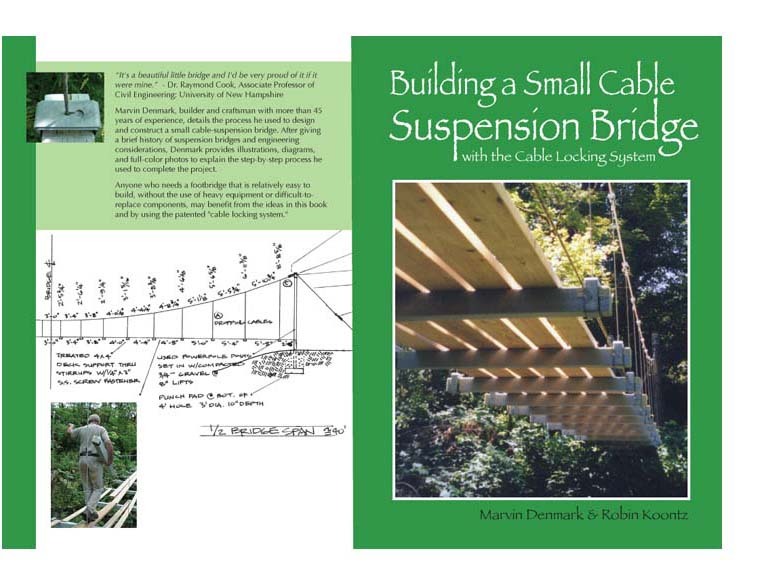 I love your idea and simple instructions for building a suspension bridge. We are considering an 80 foot span here in Waterville Maine. We wonder if you have experimented with cable stay bridges instead of suspension?? Thanks for the compliment. In the A-shape design, cables are run from the deck up to a post or tower where they are secured. The load forces are primarily on the vertical posts and on the bridge deck. That’s a cable-stayed bridge. The post or posts would have to be in the middle for an 80-foot bridge. If the post was on the bank then half the bridge would be going over the land, not much point in that. The column can also be jeopardized by the rise of the creek, but an engineer could figure all that out for you. My goal was to stay dry while I built my bridge which I managed to do. I also preferred the M-style because I like the Golden Gate Bridge! As mentioned in the blog about material costs, the shipping was too much for us to produce and sell the components, but all the information is there for your local fabricator to make what you need. Good luck! Just finished your book and thoroughly enjoyed it. The step by step descriptions have been helpful in thinking through a bridge of my own. I’m on your site hoping to find information on your next bridge (referenced in the book) so hope to find it here somewhere. Thanks a lot. Thanks, Travis! My next bridge is still a pending project, but I can tell you right now what will change, which isn’t much. The cables will go straight across, at about 36″ above the deck. They will attach to four posts which are again supported with dead men. Cable stringers will meet up with 4×4 beams that will attach using the Cable Locking System. I like the look of the “Golden Gate” style suspension bridge, but also like the look of something simpler. Plus, the holding cables will also serve as handrails, something that is missing on the original design. Some people feel more confident with a hand rail.